SR3-GEOTRACES 2018 is an Australian led research expedition along the SR3 line (approximately 140ºE) from Hobart (Tasmania, Australia) to the Antarctic ice-edge. The goal of the SR3-GEOTRACES expedition is to determine the distributions of trace metals and isotopes (TEIs), their change with time, and the physical, chemical and biological processes controlling those evolving distributions. During 6 weeks, scientists will measure TEIs, nutrients, the carbon system and ocean physics along the SR3 section. Measurements of TEIs are scarce in the Southern Ocean, particularly on repeat sections and in deeper waters. TEI distributions on the SR3 line will be compared to expeditions in spring 2001 and late autumn 2008 to assess seasonal and longer-term changes. The section will also sample for TEIs in marine particles, and stable, radioactive and radiogenic isotopes that have not been measured before in this sector of the Southern Ocean. We will also sample for TEIs in aerosol particles, and metagenomic analyses will be used to characterise the structure and function of the microbial community as a function of latitude and depth along the repeat transects. The SR3-GEOTRACES voyage aboard the RV Investigator will depart from Hobart (Australia) on 10th January 2018 and return back to Hobart on 21st February 2018, and will include 40 scientists and technical support staff from 6 nations. 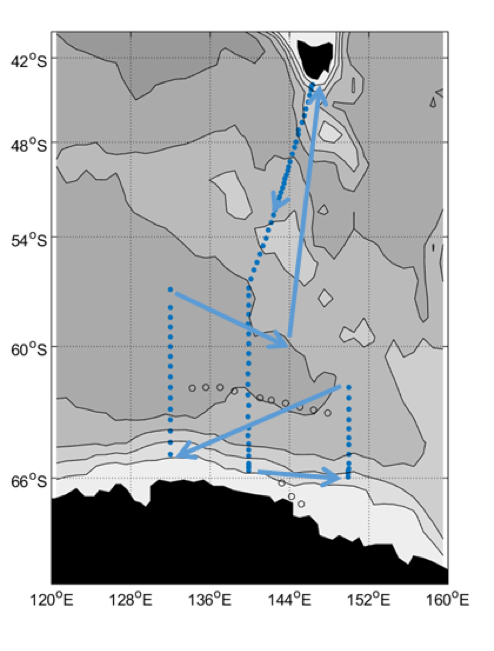 The voyage will sail along the GEOTRACES International section GS01 (please see cruise track below). The expedition will also include projects on ocean physics and carbon cycling along SR3, together with the CAPRICORN project evaluating satellite cloud, aerosol, precipitation, and surface flux products over the Southern Ocean. Figure: Australian SR3-GEOTRACES cruise track. Want to learn more about this cruise?